Ear maize (ear corn in American English) consists in whole maize ears including the cobs, the grains and occasionally the husks and portions of the stalks, depending on the harvesting method. It is a valuable forage that is fed fresh, ensiled or dehydrated. It is rich in starch and it is an energy feed for livestock, particularly for ruminants, with a nutritive value slightly lower than that of maize grain, and higher than that of maize silage (Kenyon, 2006). In addition to ear maize harvested and consumed on-farm, there are numerous products available under commercial names that contain varying proportions of grain, cobs, husks and stalks (Burren, 2013). Corn cob mix (corn cob meal) consists of grain and cobs only and is occasionally a direct result of combine harvester (Lardy et al., 2010). It is popular in European countries, both for cattle and finishing pigs (Meyer, 2015; Laurent, 2007). In American English, ensiled ear maize is called earlage, and sometimes, if it contains also the husks, snaplage (Lardy et al., 2010). There are numerous advantages in using ear maize. It can be harvested at a later date than whole plant silage (with a broad harvest window), but earlier than high moisture grain or dry grain (Kenyon, 2006). It is richer in fibre than high moisture maize grain and, unlike grain, may not require additional roughage and the associated operational costs (Hill et al., 1995; Kenyon, 2006). Its energy yield/ha is almost double that of maize grain (Kenyon, 2006). In a number of situations, ear maize is a profitable alternative to maize grain. In the USA, it is usually cheaper to grind maize ears than to shell maize and then grind it (Gillepsie et al., 2009). In France, it may be cheaper to harvest and ensile maize ears than to harvest and ensile high-moisture maize grain (Laurent, 2007). There are also some disadvantages: the presence of cob in high-moisture ear maize requires more silo space for an equivalent amount of maize grain (San Emeterio et al., 2000). 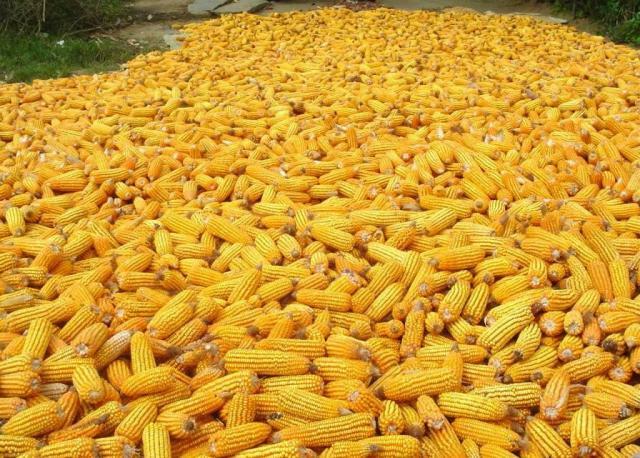 One advantage of harvesting for ear maize is the broad harvest window, from 60% to 75% DM (Kenyon, 2006). Ideally the harvested material should contain 35 to 40% moisture. Ear maize can be harvested in a number of ways. In the United States, the most common harvesting method is to use a snapper head on a forage harvester equipped with a kernel processor so that just the ear, cob and husk are harvested. Another method is to use an all-crop header on a forage harvester and take the upper one-third of the stalk along with all the ears, but the inclusion of stalks results in a product of lower feeding value. It is also possible to use a conventional combine that breaks up the cob and returns it to the grain tank, resulting in corn and cob mix (Lardy et al., 2010). 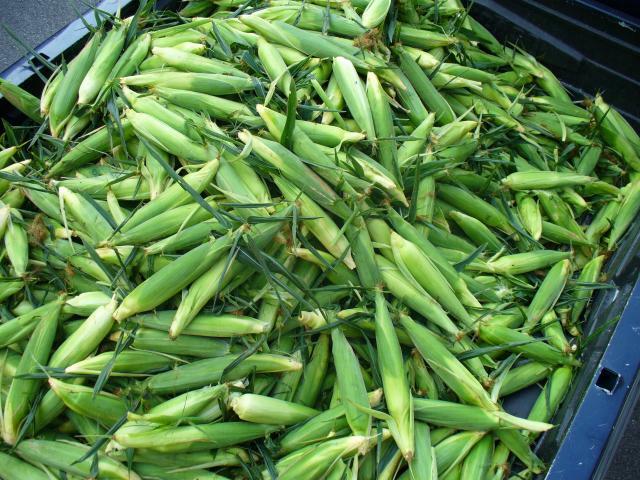 Ear maize is a moist product and is preferably ensiled for longer conservation. Generally, a yield of 10-12 t/ha of grain will relate to a yield of 21-25 t/ha of ear maize silage (Kenyon, 2006). Earlage can be stored in most structures typically used for storing maize silage, including bunker silos (recommended for storing large volumes), plastic silage bags and oxygen-limiting storage structures such as glass, steel and concrete stave silos (Lardy et al., 2010). Ear maize is a farmland grown feed resource, which increases farm sustainability by limiting purchasing of off-farm feeds, transport and cost of energy for drying (Capraro et al., 2014). Ear maize has also been proposed as an ingredient for organic pig farming (Millet et al., 2005). Ear maize usually has a composition close to that of maize grain, i.e. it is relatively poor in protein (8-11% DM) and rich in starch, though the starch content may be extremely variable (from 45% to more than 75% DM). Ear maize contains more fibre than the grain due to the presence of cobs and, in some cases, husks and parts of stalks. In the past, the cob may have comprised 22% of the dry weight of ear maize, but modern varieties contain much less cob, sometimes less than 10%, resulting in a product of higher feeding value than before, and sometimes very close to maize grain itself (Hill et al., 1995; Meyer, 2015). For example, German samples of corn cob mix in 2011-2014 contained about 3% crude fibre, which is only slightly more than maize grain (Meyer, 2015). However, ear maize may contain much more fibre (up to more than 20% DM crude fibre), due to different genetics, to a different stage of harvest or to the presence of other fibrous materials (husks, part of stalks, etc.). If harvested late, the cob is less digestible, resulting in a feed with a lower energy content relative to dry grain. Due to these sources of variability, a nutrient analysis prior to feeding is recommended (Lardy et al., 2010). Ear maize is subject to moulding and can be contaminated by mycotoxins, including deoxynivalenol, zearalenone, ochratoxin A and roquefortine (Weidenbörner, 2012). It is recommended to test for these mycotoxins before feeding ear maize to livestock (Meyer, 2015). Maize is also subject to fumonisin contamination (Heiniger et al., 2002), a risk particularly acute for horses, as a small concentration of fumonisin may induce a fatal neurological condition called mouldy maize poisoning, or equine leukoencephalomalacia (ELEM) (Huntington et al., 2002). Ear maize is an energy-rich feed suitable for all classes of ruminants, including dairy cows, growing and finishing cattle, and sheep (Kenyon, 2006; Ely et al., 1989). It is often fed ground and ensiled, and it is usually a valuable alternative to grain, for reasons both nutritional (energy value, presence of fibre) and practical (cost, ease of harvesting). Because ear maize contains a significant amount of roughage, it is a very safe feed with little risk of acidosis. However, the nutritional value of ear maize as a substitute for maize grain is variable, and it may not provide enough energy to livestock such as finishing steers. It will then require supplementation with protein and energy to achieve desired levels of performance (Lardy et al., 2010). The nutritional value of ground ear maize is about 88-90% that of maize grain and it is higher in fat (Ely et al., 1989; Gillepsie et al., 2009). The in vitro enzymatic starch degradability was found to be much higher in high-moisture ear maize than in dry maize grain (24h degradability of 90% vs. 53%) (Boas et al., 2010). Ear maize is very palatable to ruminants. Cattle thrive easily on diets based on it (Gillepsie et al., 2009). A meta-analysis of the literature showed that high-moisture ear maize (and high-moisture maize grain) tends to increase total-tract and rumen starch digestibility, and to decrease milk fat compared to dry maize grain (Ferraretto et al., 2013). High-moisture ear maize was found to combine well with maize silage for dairy cows, the diet mixing these two ingredients providing a good balance of soluble carbohydrates (Gillepsie et al., 2009). In Brazil, ear maize was found to be an energy source able to efficiently maintain milk performance (Paladini et al., 2013). In Poland, high-moisture corn cob mix included at 20% (diet DM) in the diet of high-yielding dairy cows did not have a significant impact on DM intake, energy corrected milk efficiency, fat content in milk, milk fatty acid profile and protein efficiency when compared to a similar amount of high moisture maize grain, but the harvesting costs were lower (Pysera et al., 2012). In the USA, high-moisture ear maize introduced at 38% (diet DM) in the diet of dairy cows resulted in dairy performance similar to that obtained with the same amount of cracked shelled maize (Broderick et al., 2002). Not all comparisons are favourable to ear maize: another USA trial found that feeding high-moisture ear maize compared with high-moisture shelled maize resulted in lower milk production, reflecting the lower energy content of ear maize, which is diluted by the presence of low-energy cobs (San Emeterio et al., 2000). In a trial with lactating dairy cows in the USA, grinding high-moisture ear maize increased rate and extent of rumen fermentation, thus improving utilization of non-protein nitrogen by stimulating greater rumen synthesis of microbial protein. This resulted in higher yields of milk and milk components, and greater efficiency of nutrient utilization (Ekinci et al., 1997). In an early trial with finishing steers in the USA, high-moisture ground ear maize was found preferable to dry ear maize, increasing gains in finishing cattle by 3% and feed efficiency by 10% (Beesom et al., 1956). Steers fed ear maize silage gained slightly faster and had a better feed efficiency than steers fed dry ear maize (Klosterman et al., 1960). In Brazil, ground ear maize was found equivalent to ground maize for grazing finishing steers in the rainy season (Porto et al., 2008). In a trial with steer calves in the USA, high moisture ear maize had a feeding value essentially equal to that of high moisture maize grain, but it increased DM yield of crop per ha by 18%, thereby increasing potential beef production per ha by 17% (Hill et al., 1995). In Serbia, partial or total replacement of maize grain with dry ear maize decreased DM digestibility and increased digestibility of crude fibre, whereas it increased intake and lowered performance (average daily gain) (Bačvanski, 1976). In Canada, inoculation of high-moisture ear maize with homo- or hetero-lactic bacteria, or aqueous ammonia, resulted in marginal changes in fermentation characteristics leading to similar diet digestibility and comparable performance during the finishing phase of steers (Diaz et al., 2013). Ear maize is a common and excellent source of energy for sheep, though it should preferably be ground and mixed with 5% molasses (Ely et al., 1989). However, literature is scarce. In the USA, it is recommended not to feed ground ear maize to lambs weighing below 30 kg (Umberger, 2009). Self-feeding brood ewes have been able to consume diet containing 34% ear maize (Ricketts et al., 1993). In a trial in Italy, ground ear maize silage fed at 32% (diet DM) to ewes and compared to the same amount of flaked barley gave lower nutrient digestibility, lower DM intake and lower milk performance than barley, though the ear maize diet did not have any adverse nutritional and metabolic effects (Vincenzi et al., 1999). Ear maize is rich in starch but generally considered too fibrous for growing pigs, particularly when it contains the husks. Its coarse form could cause clogging problems to automatic feed delivery systems (Capraro et al., 2014). However, it can be an appropriate ingredient in finishing pig and pregnant sow diets, in order to fulfil prescriptions concerning the presence of fibre in pig diets (EFSA, 2007). In Germany, corn cob mix silage (CCM, without husks) is a common ingredient for feeding fattening pigs. Inclusion rates ranging from 40 to 80% are recommended (on fresh basis at 60% DM), particularly because German CCM is very low in crude fibre (about 3% DM) and close in composition to maize grain. It is recommended to pay attention to the low crude fibre content and also to supplement with tryptophan if necessary (Meyer, 2015). Restricting the inclusion of CCM silage in pig feeding may be necessary to limit the dietary supply of polyunsaturated fatty acids, which may negatively affect meat quality (Sommer, 2000). Several trials with CCM silage showed that it could be used at high levels (45-47% DM) in the diets of finishing pigs (35-110 kg) with barley and protein concentrates. CCM silage-based diets fulfilled the energy and nutrient requirements of the pigs and resulted in good performance and carcass traits (Wecke et al., 1987; Wecke et al., 1988). Similar results, favourable from an economic point of view, have been obtained in Belgium with pigs fed organic fattening diets: lean carcasses with good meat quality were obtained when 40% organic CCM silage was included in a balanced diet. Pigs fed a diet with 40% organic CCM silage showed a lower DM intake, leading to slower growth, due to a bulk effect of the CCM. In outdoor pig fattening this may have the beneficial effect of preventing excessive fat accretion (Millet et al., 2005). In Italy, where the fattening period is prolonged until the pigs reach a slaughter weight of 160-170 kg, the inclusion of whole ear maize silage, including the husks, in diets of heavy finisher pigs at low or medium rates (15-30% DM) was shown to exert a positive dietary effect. This was thought to be due to its long gastric retention time and coarse particle size, which could promote the satiety of animals and limit the direct contact of gastric acids with the stomach mucosa (Mason et al., 2013). Whole ear maize silage included at up to 30% DM had no adverse effect on the performance of heavy finisher pigs when compared with traditional soybean meal-maize grain based diets with the same fibre content (NDF of 15% DM) (Zanfi et al., 2014). It could also be used at levels of 30% (DM basis) at the intermediate and final fattening stages without an appreciable decrease in digestibility (Zanfi et al., 2012). A later comparison of two physical forms (coarse or wet milled whole ear maize silage) included at 30 or to 40% DM in the diet concluded that the coarse form could be included at up to 40% DM. There was no depression in growth and slaughter traits with a potentially positive effect of coarse silage on animal satiety through a longer retention time in the stomach (Capraro et al., 2014). In the Philippines, ear maize replaced 25% of maize grain in diets for finishing pig (50 kg to slaughter) without adversely affecting performance. A multi-enzyme additive further improved feed conversion (Frio et al., 2013). Ear maize can be used to add bulk to rations for pregnant sows (Gillepsie et al., 2009). In Germany, corn cob mix is recommended after farrowing to increase intakes of protein, minerals and nutrients (Stalljohann et al., 2008). The fibre content of ear maize tends to restrict its use in poultry diets (Göhl, 1982). However, there have been attempts at using this product in poultry, sometimes with positive results. The energy value of corn cob mix silage for broilers was found to depend on the crude fibre content and on particle size (fine or medium): AMEn values ranged from 13.2 (fine) and 12.9 (medium) MJ/kg DM for CCM silage containing 8% crude fibre, to 15.6 (fine) and 15.1 (medium) MJ/kg DM for CCM containing about 3% crude fibre (Aboud et al., 1988). Several trials conducted in Germany in the late 1980s concluded that CCM silage containing up to 7% crude fibre (DM) was highly palatable and could be used successfully as the only energy source, or with cereal grains, for broilers and laying hens, provided that the diet was supplemented with protein, minerals and vitamins (Roth-Maier et al., 1986; Roth-Maier et al., 1988). In laying hens, no deleterious effects were observed in replacing maize with ear maize when a multi-enzyme was added to the diet (Devegowda et al., 2008). An experiment in Germany showed that it was possible to use corn cob mix silage supplemented with a protein concentrate for growing geese (Jeroch et al., 1992). In Poland, ear maize meal was included at 15% in geese diets (Pakulska et al., 1997). As a feed concentrate, ear maize was classically distributed ad libitum to rabbits in traditional familial production units, in regions producing maize, such as southern France. In this case, rabbits consume exclusively the grains, and waste the unpalatable cobs (Lebas, 1970, unpublished observation). Direct distribution of ear maize to rabbits is thus not recommended. In addition, residual cobs are in most cases polluted by rabbit's dejections. On the contrary, after grinding the dry ear maize may be safely included at 20%, and even 40%, in the diet of growing rabbits without any deterioration of daily growth (Pla et al., 2006; Martinez et al., 2008). For example, ear maize was included at 15% in experimental diets (de Araujo Ferreira et al., 2006). The positive or negative effect on feed conversion ratio depends on the nutrient balance in the experimental diets. In experimental ear maize, the proportion of grain was very high compared to that of cobs (88.5% vs. 11.5% of ear maize DM). The energy value was thus close to that of maize grain, despite a higher fibre proportion: 18% vs. 12% NDF (DM basis) (Martinez et al., 2008; Pla et al., 2006). If the proportion of cob in the maize ear is greater than 11.5%, the fibre content increases, and the energetic value proportionally decreases: calculated DE content is 12.7 vs. 14.7 MJ/kg DM, with an NDF value of 39% vs. 18% (DM basis) (Lebas, 2013). Ear maize is a good feed for horses and can be used as a management tool for horses that bolt (eat too fast) their grain. However, older horses or horses with bad teeth have difficulty eating it (Griffin, 2013). While it used to be a popular horse feed in the USA, ear maize is considered to be too rich in energy with insufficient fibre (compared to oats, for instance), with the additional risk of fumonisin contamination (Huntington et al., 2002). Gillespie, J. R. ; Flanders, F. B., 2009. Modern livestock & poultry production. 8th ed., Cengage Learning, 1136 p.
Ricketts, G. E. ; Scoggins, R. D. ; Thomas, D. L., 1993. Management guidelines for efficient sheep production. North Central Regional Extension Publication 240, 63 p.
Weidenbörner, M., 2012. Mycotoxins in feedstuffs. Springer, 268 p.